Bacteria are microscopic single celled organisms that are found almost everywhere, from the deepest ocean trenches to the highest peaks, as well as acidic hot springs and even inside radioactive waster, and being so small, they can also inhabit our bodies without our knowledge. A bacterial infection is described as an imbalance of bacteria that cause harm to our bodies. One of the smallest microorganisms, a single gram of soil can contain as many as 40 million bacterial cells, but they are not all dangerous, in fact we couldn’t survive without bacteria in our digestive systems to help break down our food, or bacteria on our skin to help clean our pores allowing us to absorb beneficial minerals and vitamins from the suns rays. In most cases, bacterial infection can be treated successfully thru antibiotics taken over an extended period of time, sometimes only a few days, but often several weeks. Most bacterial infections are localized to a single area of the body, and are characterized by local pain and some swelling. Infectious bacteria produce toxins which damage surrounding cells, the human immune system is often not capable fighting this, thus requiring medical intervention in the form of antibacterial medication. 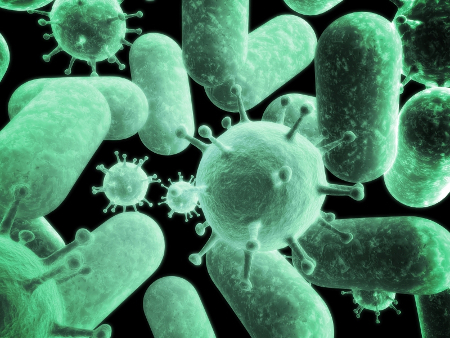 Bacteria that are harmful to humans are known as pathogens. Untreated bacterial infections can spread to other parts of the body as the infection enters the bloodstream, a condition known as bacteremia, so medical consultation when bacterial infection is first noticed should occur reasonably promptly along with plenty of rest to allow the immune system to fight infection. Viral infections can quickly turn into bacterial infections as the body’s immune system weakens allowing bacteria already present to reach a state of imbalance, although it is also possible for bacteria not present to enter the body when the immune system is fighting contagion and is weakened. Common areas often affected by bacterial infections are the throat, ears, respiratory system, sinus, urinary tract, with varying degrees of pain and swelling. Tuberculosis, a particularly unpleasant infection of the lungs, sadly still kills more than 2 million people in Africa every year. Salmonella, strep throat, cholera, gonorrhea, and syphilis are some of the most commonly known bacterial diseases that affect humans. Many common ailments such as a sore stomach can easily be misdiagnosed if they go away after a few days, but in many cases food poisoning may be the cause, perhaps from Salmonella or Escherichia coli (E. coli). Eating out in restaurants where food-handling staff do not follow proper personal hygiene standards are a common cause of E. coli. Because bacteria are living organisms they can survive on furniture, doorknobs, escalator handrails etc without risk of perishing, making it very easy for bacterial infections to spread. Modern commuter style living and global transport being so readily available allows contagious bacterial infections to quickly jump population groups and outpace medical treatment regimes. Proper cleaning of household items, bed linen, pet sleeping areas, making sure to get into hard to clean areas should be part of the homemakers regular cleaning regime if bacterial infections are prevalent.